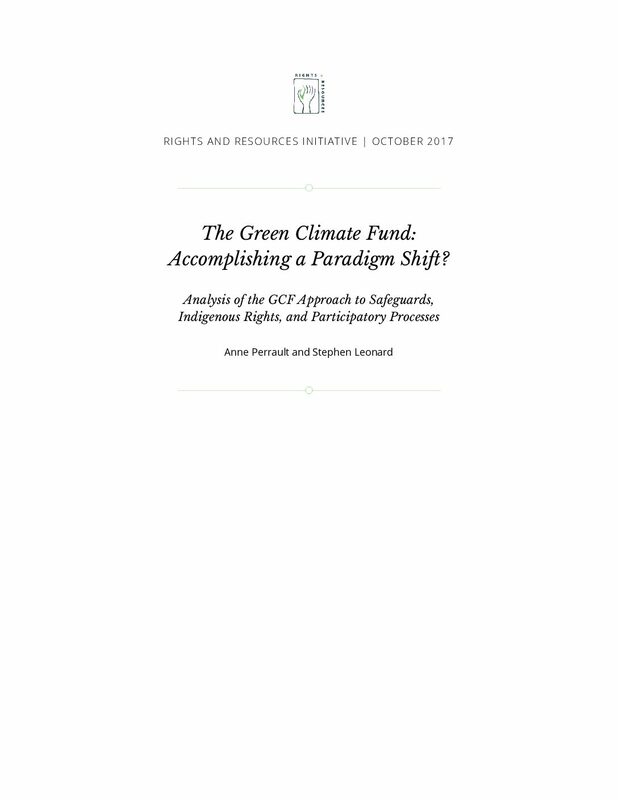 The Green Climate Fund: Accomplishing a Paradigm Shift? The Green Climate Fund (GCF), established in 2010 at the 16th Conference of Parties (COP16) under the United Nations Framework Convention on Climate Change (UNFCCC), is now the world’s largest climate financing institution. It has a current investment portfolio of 43 approved projects totaling around US$2 billion, and has 48 Accredited Entities (AEs) to support implementation, including UN agencies, banks, NGOs, and private companies. Through its investments, the GCF aims to achieve a paradigm shift in developing countries, toward low-emissions development and climate resilience. GCF investments must indicate whether and how they could impact Indigenous Peoples, local communities, and women who are most at risk from the adverse effects of climate change (e.g. via environmental and social management plans). These goals, however, are currently being challenged by inadequacies in the Fund’s policies and frameworks. GCF safeguards fail to recognize the critical contributions of rural peoples to the maintenance of ecosystem services that are essential to international climate and development objectives, and to offer adequate protection for their land and resource rights. Drawing on international standards and GCF policy documents, this report traces the adequacy and implementation effectiveness of the Fund’s current institutional frameworks across a representative sample of approved projects. Noting critical gaps in nearly every aspect of the Fund’s operational modalities and project approval processes, the report calls on the GCF to take progressive steps to make Indigenous Peoples’ and local communities’ rights a key part of its climate actions going forward. Uneven application and enforcement of interim environmental and social standards (ESS). Study results reveal a clear departure from the GCF’s commitment to apply its interim environmental and social standards to all its investments. Miscategorization of risks. GCF policies do not ensure that risks are accurately identified and categorized. Project documents reveal miscategorization and downgrading of higher-risk investments, which in turn minimizes the level of required consultation, transparency, monitoring, and mitigation. Limited recognition and protection of Indigenous Peoples’, local communities’, and women’s rights. GCF standards note that it may be appropriate for a client to complement environmental and social risks and impacts assessments with specific human rights due diligence in limited high risk circumstances only. Weak enforcement of free, prior, and informed consent (FPIC). Lax implementation requirements and project-level discretionary authority to define an investment’s area of influence and possible impacts on Indigenous Peoples and local communities have resulted in the limited application of free, prior, and informed consent (FPIC). Variable stakeholder engagement, benefit sharing, grievance/redress mechanisms, and project monitoring. Evidence of stakeholder engagement was noted across reviewed GCF projects, but the timeliness and comprehensiveness of consultations is inconsistent.